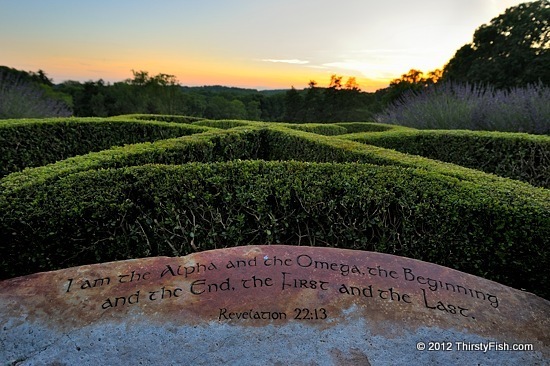 Facing West, away from the Bryn Athyn Cathedral, this stone carved inscription reads from the Book of Revelation 22:13: I am the Alpha and the Omega, the First and the Last, the Beginning and the End. Alpha and Omega are the first and last letters of the classical Greek alphabet. This verse expresses God's divine power in all things, from the first to the last. An earlier post looked at the interpretation of the Bible by different Christian denominations. More specifically, it looked at the doctrine of Sola Fide, the belief that salvation is through "faith alone", irrespective of good works. Revelation 22:12-15 reads: "Look, I am coming soon! My reward is with me, and I will give to each person according to what they have done. I am the Alpha and the Omega, the First and the Last, the Beginning and the End. Blessed are those who wash their robes, that they may have the right to the tree of life and may go through the gates into the city. Outside are the dogs, those who practice magic arts, the sexually immoral, the murderers, the idolaters and everyone who loves and practices falsehood". Let's assume that there is no afterlife; no heaven, and no hell. Does it still make sense to behave morally? Would we still need "laws"? Would it be acceptable to kill, steal, bear false witness, and to covet? How about those who have been wronged, how would they find justice? Is the sense of justice hard-wired in our brains and our consciousness? The Euthyphro dilemma asks: "Is what is morally good commanded by God because it is morally good, or is it morally good because it is commanded by God?" If the former, then justice is arbitrary; if the latter, then morality exists independent of God. Does it matter?